High school student Frank Nguyen had ideas about creating a system to easily monitor health, attributing it to his mother who had a slew of health issues and heart problems. Today, those ideas are beginning to take shape for the Grade 12 student studying at Danforth Collegiate with the invention of the HeartWatch health monitor, a wearable device that allows a person to gather and store data on their blood pressure, heart rate and blood oxygen levels. “There were new technologies coming out for an easy and basic way of monitoring a heart rate, and that’s where I started having this idea and it started taking form,” Nguyen said. Last summer, Nguyen was one of 10 high school students chosen to attend the Youth Basecamp Program at Ryerson’s Brookfield Institute for Innovation and Entrepreneurship. The program allows students to learn the basics of entrepreneurship and business and gives them the resources to create their own startup. 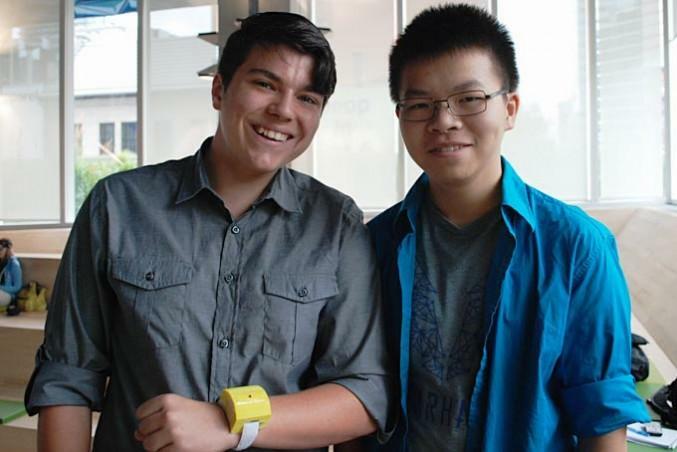 Nguyen was given $1,000 and created a team to build the HeartWatch. He invited his close friend and fellow classmate, Andre Bertram, to work alongside him and co-found their startup, HelpWear. Bertram says what differentiates them from different heart monitoring products on the market is the HeartWatch’s embedded SIM card that can be used to call Emergency Medical Services (EMS) should a user be in distress, or have their heart rate fall into an irregular range. An internal GPS would be used to locate the device, should the person need help. Most other Personal Emergency Response Systems companies currently have a button a user can press to contact the EMS on their devices, but it still relies on another telecommunication system, Bertram said. “What Frank and I were discussing was because of the aging population in Canada, we think it’s very important for there to be a very easy system where they don’t have to rely on, for example, cellphones or Bluetooth,” Bertram said. Encased in a chunky yellow compartment and wrapped around the wrist in a piece of white velcro, the current prototype of the HeartWatch works by emitting a green light that looks into the red of the blood in a person’s capillaries. Volumetric readings from the sensor would allow the device to record the blood pressure and variation of the heartbeat. The two 17-year-olds were then chosen as one of the top three projects after working on the six-week program. They pitched their project to a panel of investors and academics at the end of Basecamp last August.